In Delaware it is a crime to possess or sell illegal drugs. The charges and penalties you may face vary based on the type and quantity of drugs. When the quantity of the drugs is greater, the penalties are more severe. Also, if there is an aggravating factor present, or if you have one or more prior conviction for drug dealing, the penalties are more severe. For the purpose of charging a person with a drug offense, Delaware categorizes amounts of drugs into tiers, ranging from Tier 1 to Tier 5. Possession of a Tier 1 quantity results in the least serious charges because it is the least amount of drugs, and possession or selling of a Tier 5 quantity results in the most serious charges because it is a greater amount of drugs. 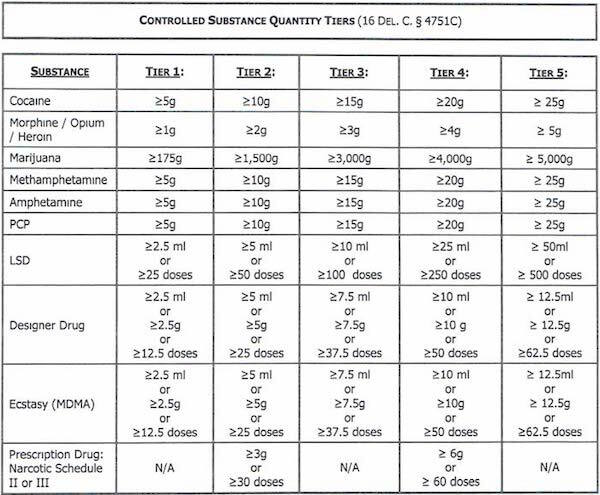 The chart below shows how Delaware categorizes drugs and controlled substances into tiers based on the type and quantity of the drug. Possessing or using an illegal drug or controlled substance is known as the crime of simple possession, a class B misdemeanor. If you plead guilty to this charge, you would typically face probation and/or the payment of fine and court costs. If you are found in possession of an illegal drug or controlled substance, and one of the aggravating factors listed above apply, the crime is elevated to a class A misdemeanor. The presumptive sentence for a class A misdemeanor is 12 months on level II probation. You will be charged with aggravated possession—a felony—if you are found in possession of a Tier 1 quantity (class F felony) or a Tier 2 quantity (class E felony) of an illegal drug or controlled substance. Our office has had past success getting aggravated possession cases dropped down to simple possession. Delaware has recently decriminalized possession of marijuana for personal use. Under the new law, 16 Del. C. §4764(c), any person 21 years of age or older, or over 18 and it is he or she’s first offense, who is found in possession of, or who privately uses, 1 ounce or less of marijuana will be assessed a civil penalty of $100. Civil penalties will not appear on your criminal record. If you are between the ages of 18 through 20, and you commit a second or subsequent offense, you will be guilty of an unclassified misdemeanor and fined $100. This statute only decriminalizes private use of a personal quantity size of marijuana. If you consume a personal quantity of marijuana in a public area, you will be charged with an unclassified misdemeanor and may be fined up to $200 and/or imprisoned for up to 5 days. Under this law, public places include sidewalks, streets, parking lots, parks, playgrounds, stores, restaurants, or any area where the general public is invited; any outdoor location within 10 feet from any of those areas; and any outdoor location within a distance of 10 feet from the entrances, exits, windows that open, or ventilation intakes of any public or private building. This law has no effect on law enforcement’s procedural rights regarding search and seizure. Nor does this law affect the illegality of operating a vehicle under the influence of marijuana. Accordingly, if you operate a vehicle under the influence of marijuana, even if it was personal quantity size, you may be charged with Driving Under the Influence. You may be charged with simple possession of marijuana if you possess or consume more than 1 ounce of marijuana but less than the Tier 1 quantity (175 g). Simple possession of marijuana is an unclassified misdemeanor, however if the offense occurs with an aggravating factor or you have a qualifying prior offense, the crime is elevated to a class B misdemeanor. Using or possessing with the intent to use drug paraphernalia is a class B misdemeanor. Examples of drug paraphernalia are bongs, bowls, pipes, wrapping papers, syringes, needles, etc. In Delaware, the penalty for a first time offender is typically an order by the court to pay fines and costs or non-reporting probation depending on the deal your attorney secures. Possessing with the intent to deliver or sell, or delivering drug paraphernalia is a class G felony. The penalty for this crime is up to six months in jail. In Delaware, if you manufacture drugs, deliver drugs to another person, possess drugs with the intent to deliver them, possess drugs over a Tier 3 quantity, or possess drugs in a Tier 1 quantity and there is at least one aggravating factor, you will be charged with Drug Dealing – Aggravated Possession. Drug dealing is the most serious drug crime in Delaware. The charge of Drug Dealing – Aggravated Possession ranges from a class D felony to a class B felony. The penalties for drug dealing are based on a sliding scale, and become more serious when the tier quantity of the drug is higher (heavier weight of drugs), and if there are aggravating factors present. Drug Dealing – Aggravated Possession – selling a small amount of marijuana or under five grams of cocaine is a class D felony. The presumptive sentence is up to two years in prison for these offenses. If this is your first offense and there is an aggravating factor present, such as the drug dealing occurred in a vehicle or a school zone, the Drug Dealing charge will be a class C felony with a presumptive penalty of up to 30 months in prison. If you have one prior drug dealing offense that occurred within the last five years of either of these offenses, the charge will be elevated to a class C felony and you would be facing 30 months in prison. If you have two drug dealing priors within 10 years of this charge, you would be charged with a class B felony which carries 2-5 years in jail. See the Offense chart and the Penalties by Offense Classification chart for help in understanding the penalties you face for your drug charge. Our office has had success in past pleading serious drug dealing cases down to probationary sentences and even misdemeanor possession charges. We typically do not accept the first plea offer and are persistent and pressing the case to final case review and even trial. If our office can find a valid defense or hole in the prosecution's evidence a compromise can usually be reached that takes jail off the table. There are ways to challenge drug offenses and the prosecution's evidence. The secret is having an attorney that has the knowledge to find the defense or hole in the prosecution's case. the consent given to search the property was coerced by police. The penalties for violating Delaware’s drug laws may result in serious consequences. A good attorney can make the difference.Contact Jason R. Antoine, Wilmington Drug Crime Defense Attorney at (302) 482-4802 for a confidential consultation regarding your case. We will go through your evidence with you in detail and come up with a solution to your case. Call for your free consultation today at (302) 482-4802!